On Friday, I met my sister at the East Falls Church Metro station around 3, fresh from her two-hour trip out to UMD for a ten minute meeting. We wandered around Ballston Commons for about an hour and a half, taking in the sights and determining that the athletic shoes I bought a year ago are worthless for continuous walking. We were waiting for Rebecca to get off of work and join us for a round of drunk croquet, and with time to spare after our constitutional, we decided to see a random movie at the Ballston theatre. The only one playing with a matinee price was The Kingdom with Jamie Foxx, Jennifer Garner, and an unbilled Jason Bateman. The movie was pretty decent, with a riveting beginning and end and a more slow-paced middle section, interspersed with fun explosions and chase scenes. Worth a rental but won't change your life (if you want a life-changing movie, then watch URI Home Videos, 1979 -1981 for the scene where I change my own diaper). After the movie, which was shown in a frigid theatre where icicles formed on the undersides of seats and moviegoers, we met up with Rebecca and had dinner at the Rock Bottom Brewery where I had to finish my sister's beer because she is a lightweight. We also bumped into Jack there, quite the cosmic coincidence. From dinner, we took my sister home to my parents' house where she's been living for the past few weeks with her three cats while she does Vet Science internships at various area colleges. 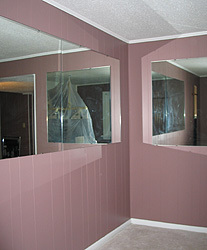 Saturday was basement-work day, during which my dad and I hung some smokin' mirrors, painted trim, and touched up our milk chocolate masterpiece. Incidentally, milk chocolate is not a colour that inspires capital letters the way PUFFIN BAY GREY does -- it seems to have a literary inertness which PUFFIN BAY GREY lacks. After painting, I won $50 in poker, with the assistance of Messieurs Guinness and Killian, which I'm going to deposit in a mutual fund for Booty's college education (BOOTX). I'll have to win some more games to send Amber, or else she'll end up going to technical school and become a car mecatnic. Sunday was a lazy layabout day which included a trip to Friendly's, some reading, and a game of Monopoly, which I hadn't played since I left Tallahassee. I landed on Boardwalk during the first round and decided to buy it to be different (normally I never do). After that I proceeded to land on it at least seven more times, but never once collected any rent. After a healthy meal of chimichangas for dinner, I went to bed, ready for the start of OCTOBER 2007. Long Island can be a dangerous place for wandering rabbits, experts say.